Chapel Row is located about 4 or 5 blocks from Auburn's campus. The 1 bedroom units have plenty of built-in storage, and 2 closets in the bedroom. They also have a small back patio for a grill or getting some sun. The 2 bedroom units are being renovated in 2014. We are knocking out a wall between the kitchen and living room, and adding a washer and dryer to a really roomy floor plan. There is also plenty of visitor parking at Chapel Row. Pet friendly. 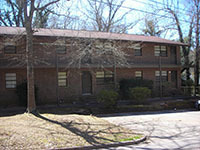 Park Hill is located about 3 or 4 blocks from Auburn's campus and Downtown area. 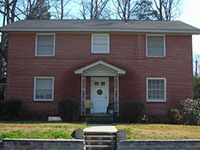 The 30 units at this location have a BIG variety, both in terms of size, price, and floor plan. Many of these units were built in the 1940's, and have the original hardwood floors, and the original knotty pine walls. The floor plans are very basic, but there is A LOT of built in storage in them. Some of the units have large back patios for grilling or just relaxing. This location has a central laundry on-site and there is a decent amount of visitor parking. Park Hill is pet friendly! 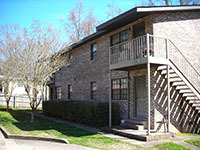 The Broadway Apartments are our latest rehab project. Each unit has a very large living room and 2 big bedrooms. The location is about 1 mile from Auburn University, but we will also offer discounted parking at Center Court for our Broadway residents. Pet friendly! 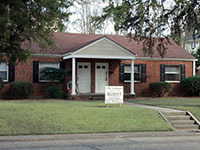 The Columns is a set of 3, 2 bedroom duplexes that are within walking distance of Auburn University and Downtown Auburn. The Columns is pet friendly.